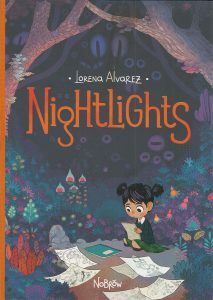 You might be able to tell by the cover of Nightlights that Colombian-born artist Lorena Alvarez does a lot of her work in three rather than two dimensions. Nightlights is her first book, but in addition to her other visual art and design projects, she makes plush toys and works with La Procesion Puppet Club, a Colombian group of experimental puppeteers. Nightlights flew largely under the radar in the US after its release in late 2016. Beyond library journal blurbs, most of its online reviews are British. 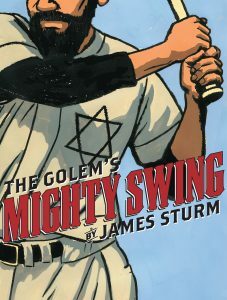 Perhaps it’s too creepy and weird for parents in the U.S. Perhaps we prefer our surrealism in the primary colors and less sinister creatures of Dr. Seuss. 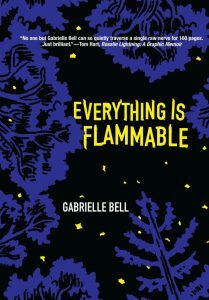 But all kids know that the world is scarier and more dangerous than their parents let on, and most of them eat up stories like Nightlights: rather than be protected, they want to see their fears on the page so they can exorcise them, and envision ways to conquer them. What kinds of fears, exactly? In the case of Nightlights, much more complicated and mature fears than you might think. 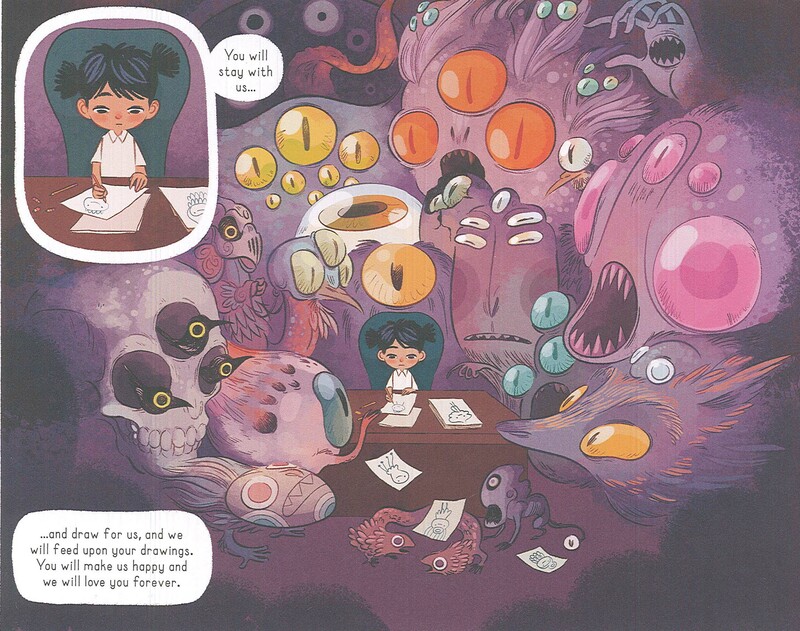 When Sandy, the story’s protagonist, finds herself lonely and craving an audience for her drawings, a ghostlike girl, Morphie, appears just in time to become her biggest fan. 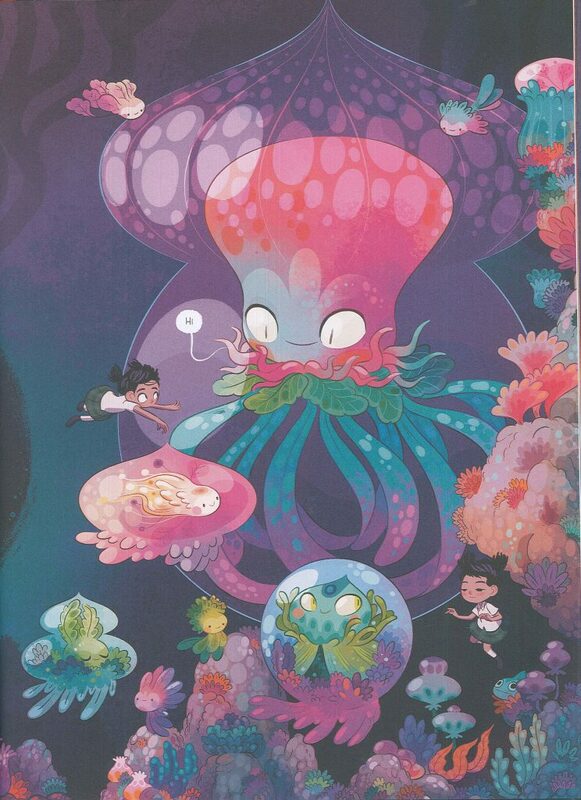 As the story unfolds—and it unfolds almost literally in this book, as images stretch themselves over page turns—Morphie’s admiration transforms into a threatening, insatiable hunger. Look familiar? No, it doesn’t look familiar to me either, at least not visually. But as Sandy and Morphie’s relationship develops, it begins to echo the worst elements of our “Like”-driven culture. Despite her youth, Sandy does succeed in escaping the trap of external admiration, and maintains her own artistic and personal integrity. Her ingenious means of escape reminds us all to keep gathering knowledge from wherever we can find it. You never know when that tedious math homework might come in handy. 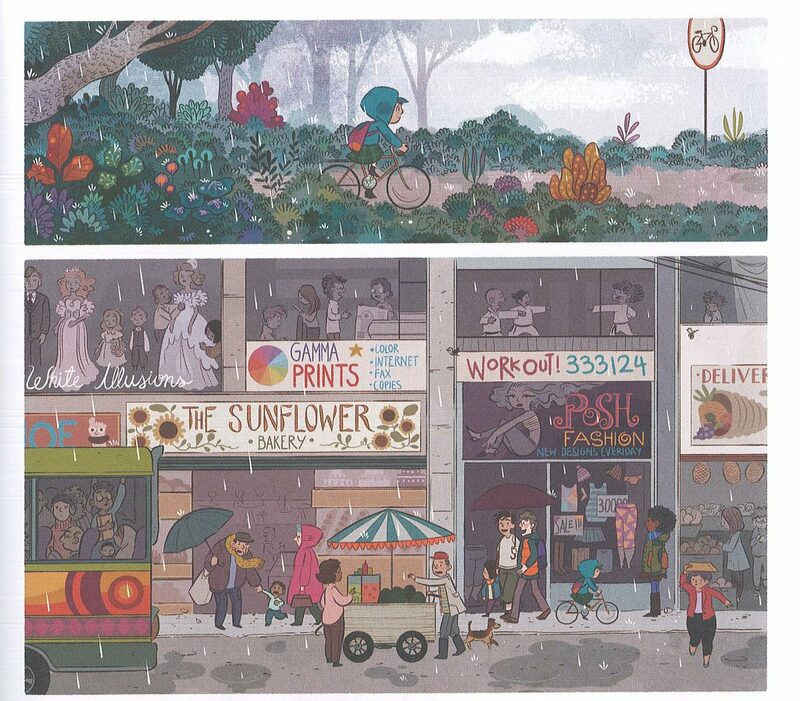 Sandy’s urban and rural landscapes are just as immersive as her dreamscapes: Alvarez’s illustrations are expertly atmospheric. 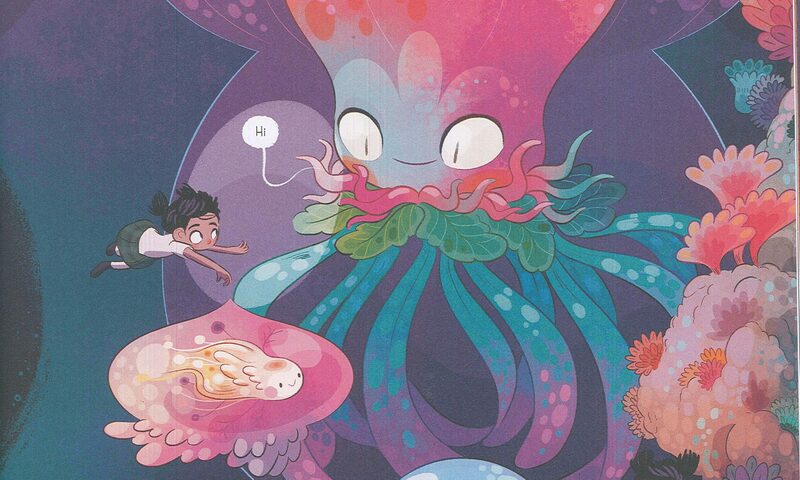 Her dream drawings center mainly on the visual—although I admit that for me, my desire to poke that squishy-looking octopus brings in a sense of touch—while scenes like this expand into other senses: I can smell the bus exhaust and feel the rain. In short, Alvarez somehow manages to illustrate longing, whether for a touch, a location, or a less tangible desire. “When I wrote the first draft for Nightlights I was living in a small town in Arkansas,” she told British reviewer Mat Tobin. “Being in a place so different from Bogotá gave me enough distance to see things in perspective, to appreciate my personal story in a different light,” and clearly, to translate her longing into art that we can all relate to, no matter the shape of our own dreams. for keeping me flush with beautiful books to review. You can find all of these titles at the store, or order them (free shipping!) if they’ve run out. PLEASE do the reviews. All of them. 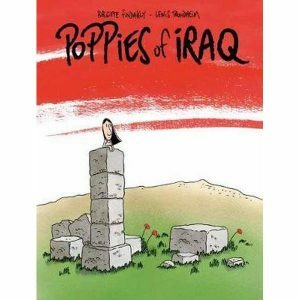 Esp Poppies of Iraq!